When it comes to Christmas, I'm a traditionalist. I like red and green. I love warm white Christmas lights. I'm a fan of glittered pine cones and berry wreaths and red bows. 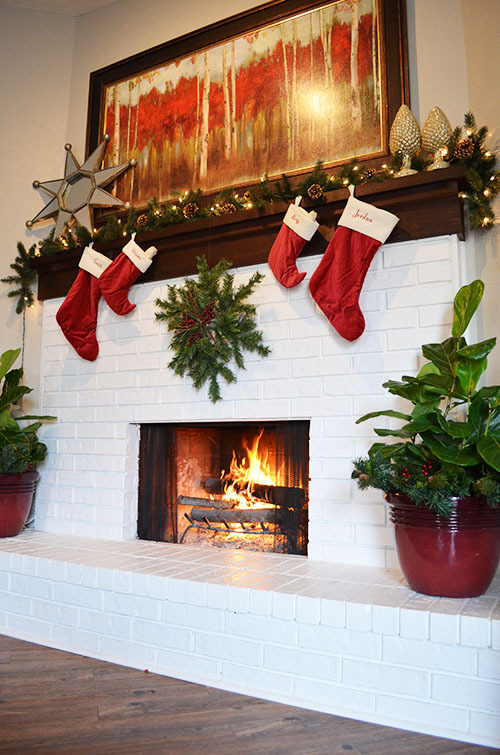 I think everything should be warm and cozy for the Christmas holiday, so that's the vibe I went for when decorating our mantel this year. The first thing we did was switch out the artwork above the mantel. The turquoise painting went to the garage, and out came the red and green birch forest scene that fits so well this time of year. The garland is just some basic pre-lit stuff, but I added some gold-glittered pine cones to spice it up a little bit. I think I bought them during the 90% off post-Christmas sale at Lowe's last year. 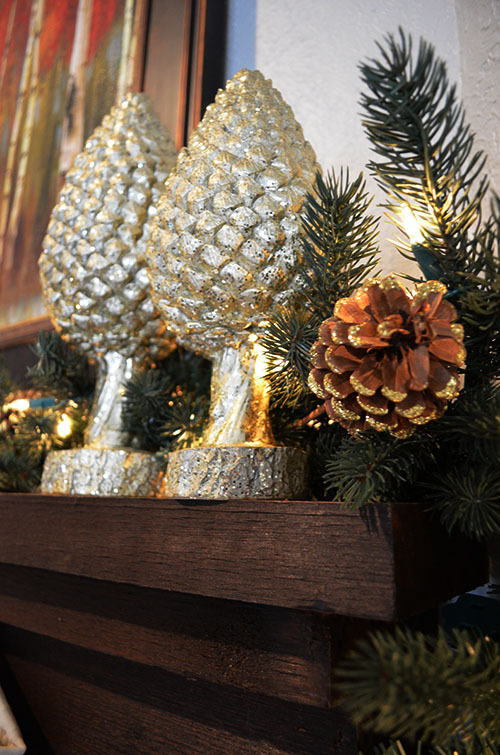 The champagne glittered pine cones are from Hobby Lobby (2011). Last year I used them in my holiday centerpiece. 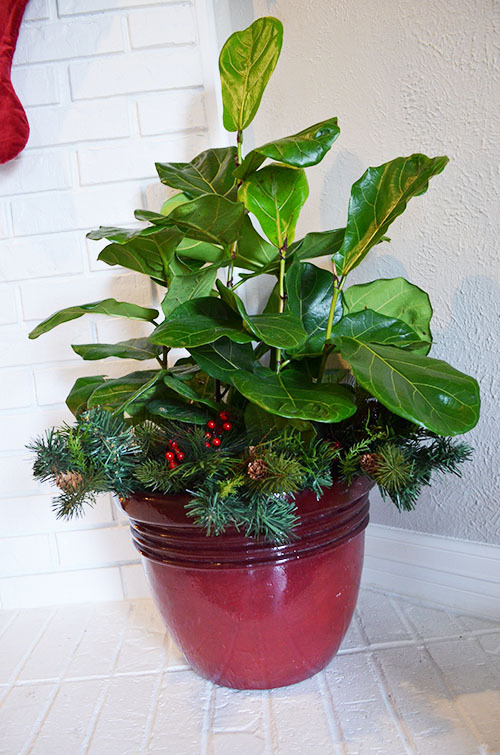 On either side of the hearth, we have my new Fiddle Leaf Fig plants, supplemented at the bottom with some Christmas sprigs from Michael's. 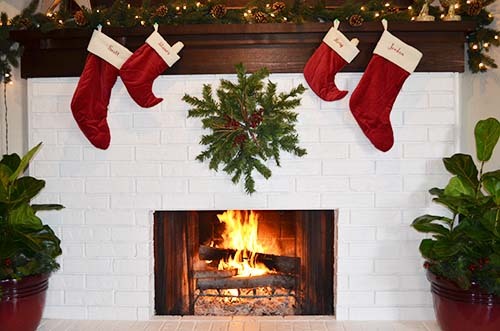 The stockings are from Pottery Barn (make sure you wait until they have the free monogramming sale), and we've had them for a few years now. 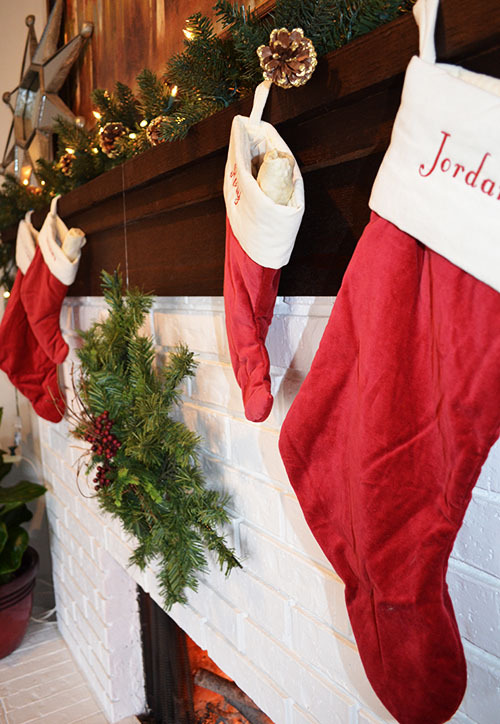 The puppies already have rawhides in their stockings! The sunburst mirror (HomeGoods) is something we had elsewhere in the living room, but the Christmas tree was covering it up. I decided to use it on the mantel so we would have some sparkle on either side. I think it strikes a nice balance with the glittery pine cones. The snowflake thingamabob in the middle is hanging with a piece of fishing line. That's another purchase from the post-Christmas sale at Lowe's. Love it! 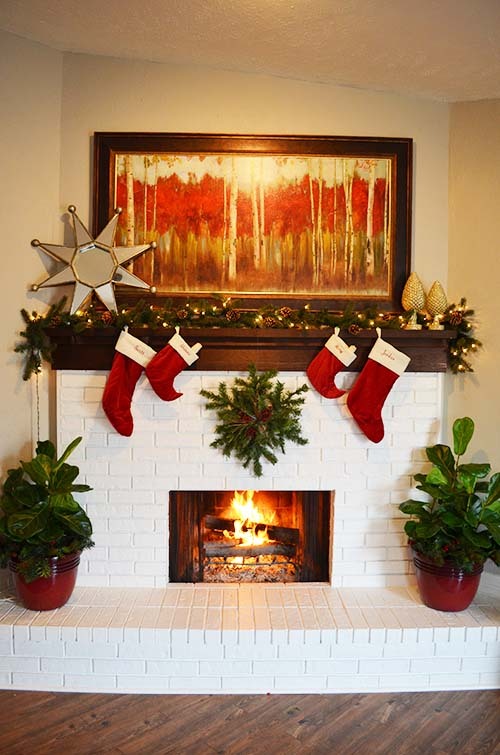 Painting our fireplace and building that mantel was one of the best things we ever did. 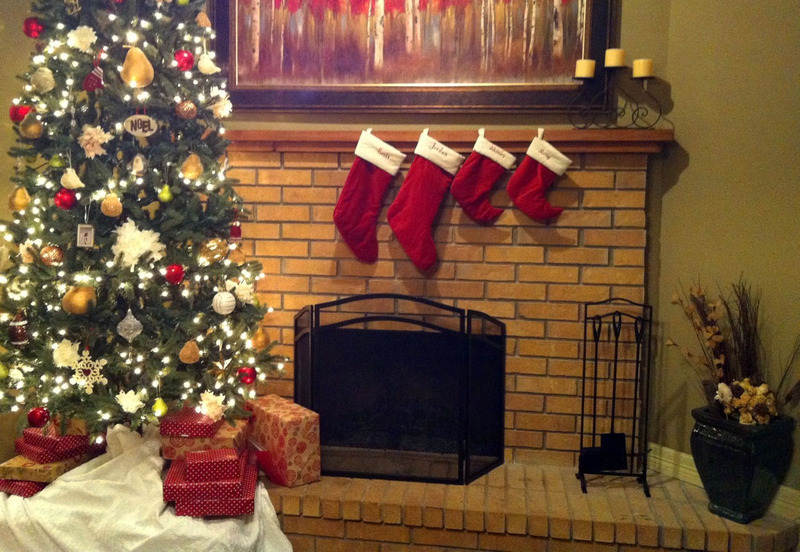 It makes our Christmas decor look SO much better. 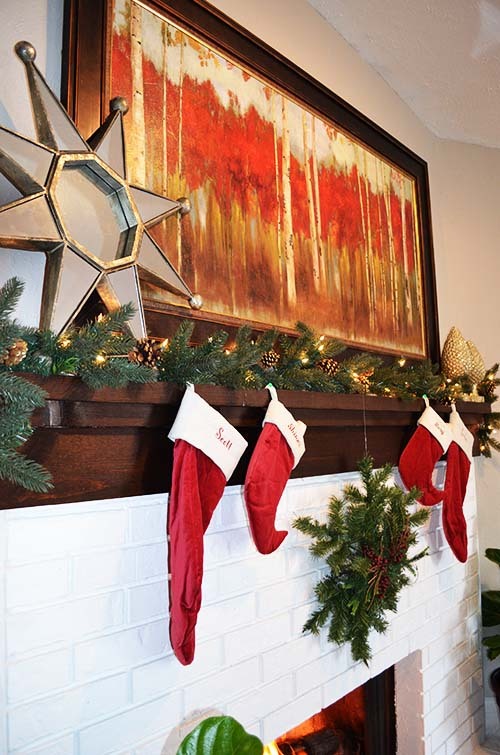 It just wasn't as cute during our first Christmas in this house when we still had the tan brick. So, what kind of Christmas decor do you prefer? 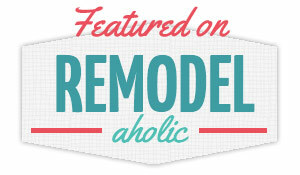 Are you into the traditional style, or do you prefer something a little different? Colored lights or white lights? I'd love to hear you favorites! 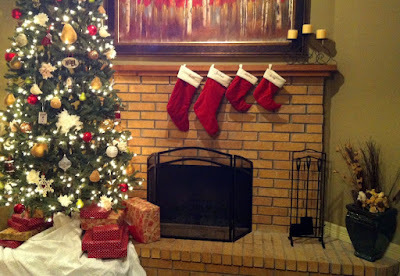 I'll be posting more Christmas-y stuff this week, including our holiday home tour and Christmas tree!